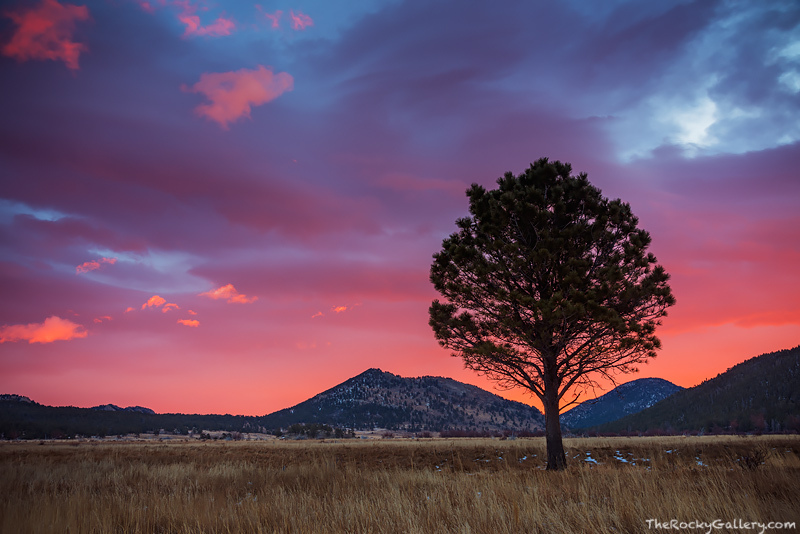 Have you ever been lucky enough to witness one of Rocky Mountain National Park's legendary sunrises?. If you've been lucky enough to watch the sunrise on a morning when the sky is filled with clouds then you know just how amazing a sight it can be. I've been lucky to see my share of beautiful sunrises over Rocky Mountain National Park through the years but I never tire of them as each one is unique and beautiful. This December sunrise from Moraine Park is one of the most memorable. As I hiked out into Moraine Park before sunrise, I had a feeling sunrise was going to be something special. The horizon over the eastern plains of Colorado already showed hints of color as I setup my camera equipment by this lone Ponderosa Pine. As the sun rose over Moraine Park the high clouds in sky expolded with color to the east. Photo © copyright by Thomas Mangan.